Deduction of Interest on deposits in Saving Accounts. While filing Income Tax return for FY 2013-14, you may be wondering whether to include saving account interest in Gross Total Income. Can I get any deduction on it? Yes there is good news for Individual and Hindu Undivided family. They can claim Deduction of Interest on deposits in Saving Accounts as per Section 80TTA of Income Tax Act as with effect from Assessment year 2013-14. As per provision of Section 80TTA, Individual and HUF can claim deduction of interest up to Rs.10,000. Interest on saving deposit can be qualified for deduction and not on time deposit. This deduction is available to only Individual and HUF assessee and not to any other assess like partnership firm, AOP, company. Interest on saving with a banking company, a co-operative society engaged in carrying on the business of banking (including a co-operative land mortgage bank or co-operative land development bank) or a post office is eligible for deduction. It is to be noted that interest on saving account with post office is exempted up to Rs.3,500 in case of single account and Rs.7,000 in case of joint account. Hence this interest portion is not to be included in Gross Total income. 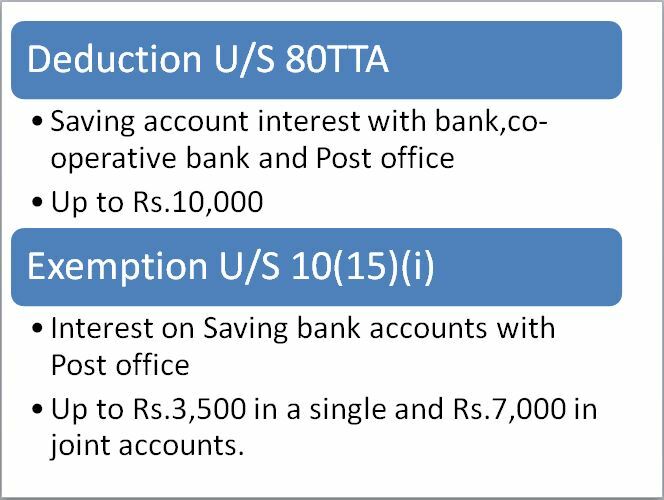 While in case of interest on saving account with a bank, co-operative bank or post office, assessee is required to add interest to his Gross Total Income as “Income from other Sources” and subsequently he has to take deduction of Interest on deposits in Saving Accounts u/s 80TTA up to Rs.10,000 from his Gross Total Income.